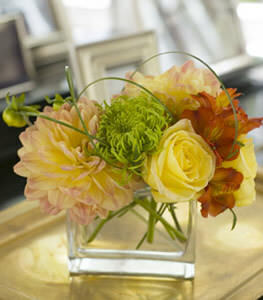 Traditional favorites go trendy in this exciting contemporary floral arrangement. Which makes it a happy choice for just about anybody. A rectangular clear glass vase filled with orange dahlias (when in season), yellow roses, orange alstroemeria and a green spider chrysanthemum, accented with bear grass.